SUBSCRIBER DISCOUNT Subscribers to F&P qualify for a 20% discount. This discount cannot be used in conjunction with any other promotional discount offers. Please verify your email address at the top of the payment page to automatically receive your 20% discount. INCLUSIONS MASTERCLASS 1 ONLY- 28 Aug, 8am–12noon: Arrival tea/coffee, morning tea, lunch, name tag, delegate bag. MASTERCLASS 2 ONLY- 28 Aug, 1pm–5pm: Lunch, afternoon tea, name tag, delegate bag. MAIN CONFERENCE ONLY: 29 and 30 Aug, 8:30am–5:30pm: Arrival tea/coffee, morning tea, lunch, afternoon tea (both days), name tag, delegate bag plus networking drinks on Wednesday (5:30-7:30pm). INSURANCE Whilst Bombora Publishing carries appropriate insurance for the conference, it will not accept any liability for damages of any nature sustained by participants or their accompanying persons or for loss or damage to their personal property. It is recommended that you take out appropriate travel and medical insurance before travelling to the conference. CANCELLATIONS Cancellations must be made in writing to the [email protected] no later than 30 July 2018. A 50% cancellation fee applies. Cancellations received after this date will not be eligible for a refund, however registrations may be transferred. Copyright 2019 F&P. All rights reserved. 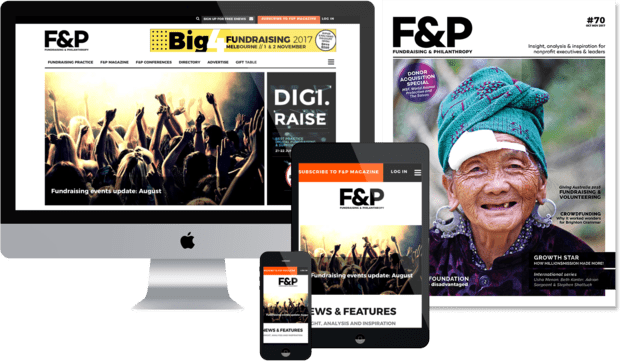 F&P brings you all the latest in fundraising including case studies, best practice, strategy, trends and benchmarks, thought leadership & industry insights.